HA NOI (VNS) — Minister of Transport, Dinh La Thang, has agreed with a Ha Noi People's Committee plan to resettle residents living under railway bridges to help prevent encroachments and accidents. At a conference yesterday, Minister Thang asked the committee to work with the railway sector to resettle the many people who lived under the Long Bien and Thang Long bridges by the end of this year. He demanded that plans for relocation, including areas where residents were to be shifted, must be clear. Vice chairman of the committee, Nguyen Quoc Hung, said encroachments onto railway corridors and level crossings was still a problem, despite the authority's efforts. Hung said people living under the bridges had encroached on trading activities and negatively affected the image of the city. He said the city had proposed to relocate these people many times, but the problem remained unsolved. Hung said the city would issue a supportive policy on housing for these people if needed. Tran Ngoc Thanh, general director of the Viet Nam Railway Corporation (VRC) agreed to work with the city to solve the problem by the end of this year. 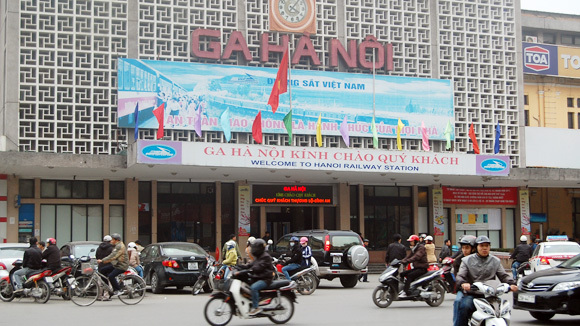 At the same meeting, Colonel Dao Thanh Hai, deputy head of Ha Noi Police Department proposed to move Ha Noi railway station out of the city centre to reduce congestion and accidents. He said that the relocation of the station, located in Hoan Kiem District's Le Duan Street, was necessary as trains caused congestion at city crossings. The proposal received support from vice chairman of the city's committee Nguyen Quoc Hung, who claimed that railway accidents were on the rise. However, Thanh, general director of VRC, said the location of Ha Noi Railway Station was integral to the city's urban planning. If the relocation was implemented, he had no idea how the urban railway system would be affected in the next 10 years. A report from the ministry's VRC showed that railway accidents across the country increased by 30 per cent compared with the same period of last year. They resulted in 37 deaths and 48 injuries.